I thought last year was magical. I had no idea it would get even better. This Christmas season has proven to be the best ever now that we have a three year old! Since I love a good tradition, we took Liam (and Finn!) 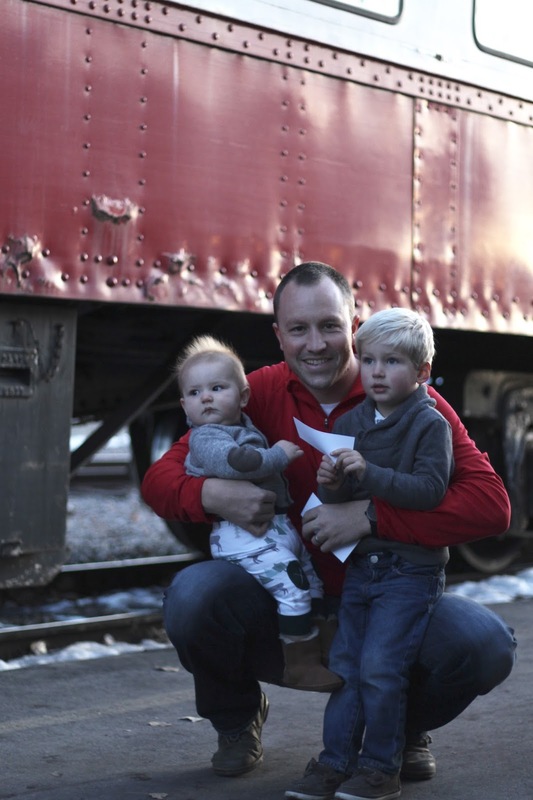 on the North Pole Express again this year! We read the book over and over again, as it is one of his favorite Christmas ones (and mine too!). The night before our train ride, I whipped up some hot cocoa with a ridiculous amount of marshmallows. We snuggled up and watched the movie together, just building anticipation for the excitement of the next day! 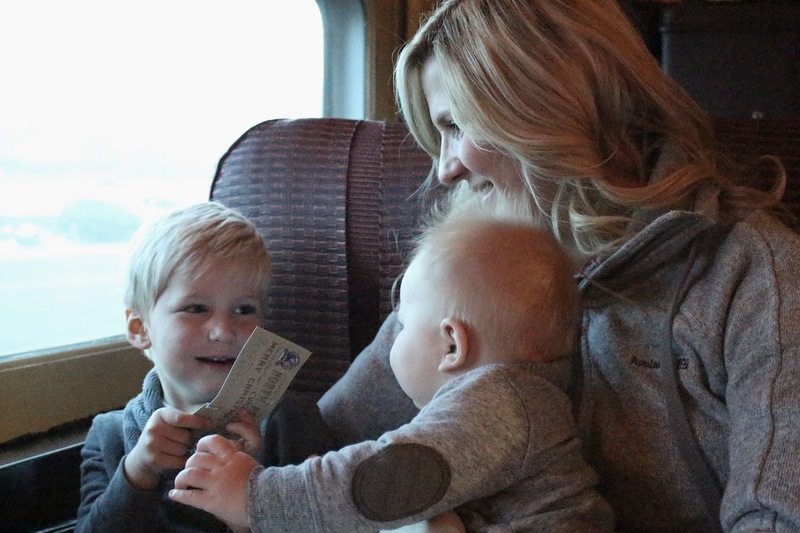 Unfortunately, Finn didn't love our little trip as much as mom and Liam. He was still mesmerized by all the lights, sounds, caroling, and visits from the Claus family; but only in spurts. His new tooth seems to still be bothering him, so he had his moments of fussy during the trip. Conor & I passed him back & forth between bits of chocolatey goodness and he wiggled his way through the whole adventure. 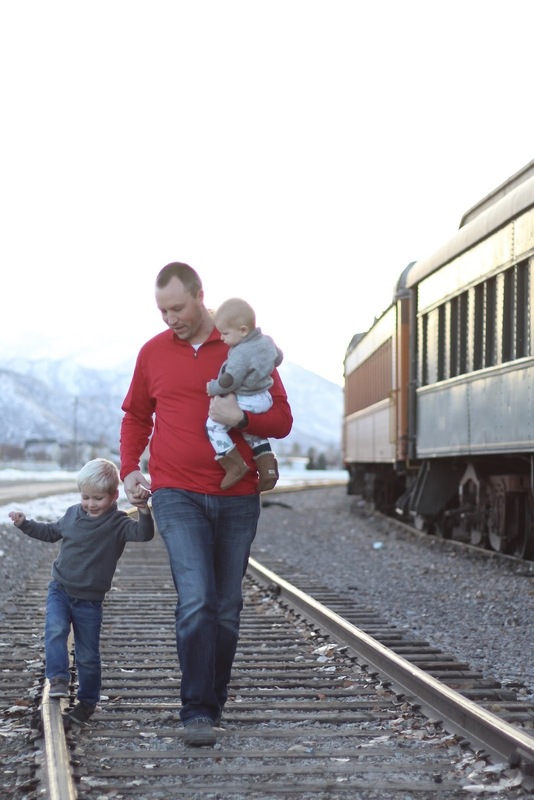 He finally settled once we got home later that night after a quick stop in Heber City for pizza (as we did last year) and a good 40 minutes in the car with many a jingling bell from santa and too many uncomfortable tears from our little Finn. This is a tradition we will most certainly continue (at least as long as we live in Utah) and I can't wait to watch the boys experience it again each year as their understanding and wonder of the season grows! Even if Finn wasn't super cooperative it looks like an amazing adventure! I need to find one of these close to us. Love the pictures! 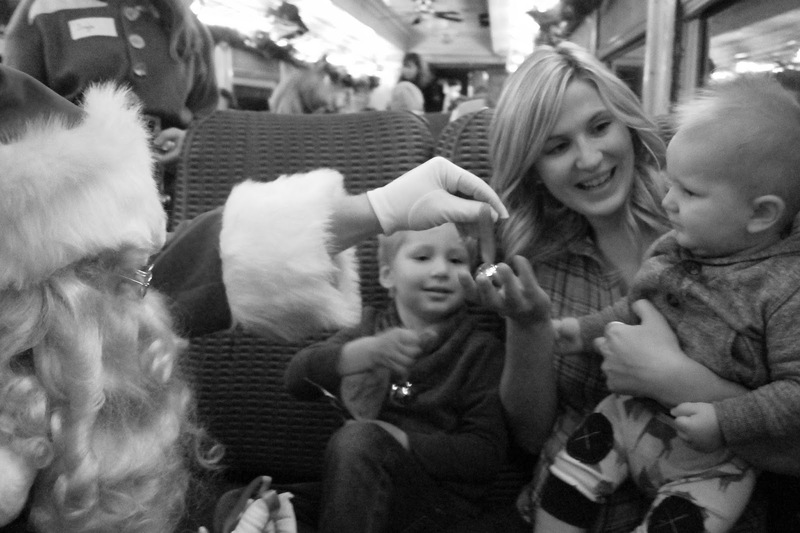 We are doing a North Pole Express this year for the first time and this makes me so excited! Love that you had as much fun as Liam! Love it! We just read the book for the first time this year and totally had me crying when reading the last page! Emotional mommy for the win! Planning to watch the movie with Noah today :). And totally agree that Christmas really does become super magical with a 3 year old... They just get it!!! Oh my goodness!! Love these pictures of your boys! 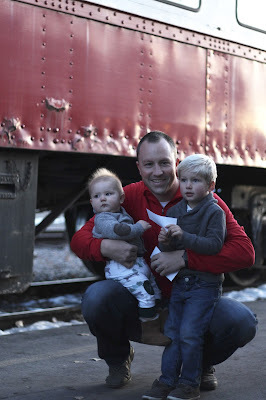 There is a polar express train in Flagstaff that I want to take Odette to as well :) My husband and I decided to wait until next year when she's three because she is still very temperamental lol. I'm so excited though and I can barely wait a whole year! The railroad experience sounds ah-may-zing! Like you, I thought last year was magical. It doesn't hold a candle to this year! Apparently it just gets better and better! Such great pictures to illustrate such a wonderful tradition! Poor Finn and his tooth! Seems like he was able to use the distraction of the train ride to his advantage at least a bit. I SO wish we had something similar here. I have no doubt the kid(s) would enjoy every bit of it! You got some gorgeous pictures! I thought car rides put babies to sleep but my second screams louder lol. Thankfully she finally outgrew that stage. Poor Finn, teething is no joke. I love love love family traditions! Looks and sounds like y'all had a magical time! I love the photos! My son was the one to lose his ticket right when the conductor got to him. He dropped it in the transfer to hand it over and it flew right under a few seats! The conductor whipped another one quickly out of his pocket and said "I found it" right when Mason retrieved his! So, he got two! And the amazing conductor punched both! So fun. Oh, this is awesome! My mom and I are taking Mac on the Polar Express next week and I'm SO excited! It'll be dark, so we won't be able to get as many awesome photos as you got, but I'm pumped! We've been watching the movie on repeat! Oh my gosh!! That is so magical, I cannot believe that's where you live. I've only seen the movie, and I thought the movie was beautiful. 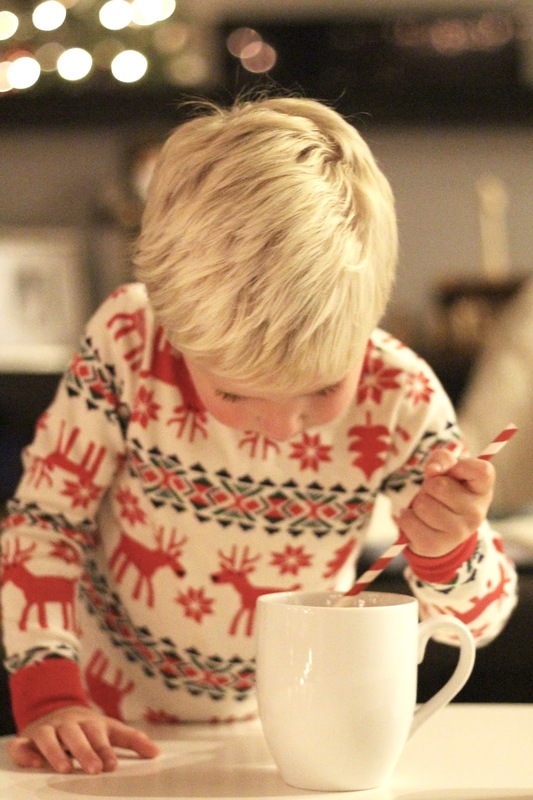 Hot chocolate always makes a winter more Christmasy. I wish we had this where we lived, I think Sophie would enjoy it. Y'all are so adorable!! At least you still had a good time even with a little grumpiness.